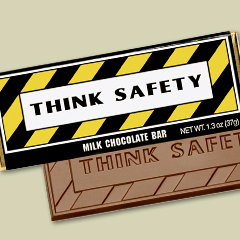 Our "Think Safety" candy bars are very popular, and rightfully so! You can't stress enough the need for SAFETY! This particular "Safety" themed Candy Bar is perfect for Construction Companies, Hospitals, Schools, Rehab Facilities, Transportation Companies, Police and Fire Stations, Electric Companies, or any facility. Our Think Safety Candy Bar Wrappers are surrounded by the most delicious Belgian chocolate! The chocolate is molded exactly the way you see it here, stating "Think Safety"! We guarantee that the recipient will thank you for this delectable treat! **please note that during the months of May-Sept chocolates need to ship 2 day air, on ice, to prevent melting in transit.